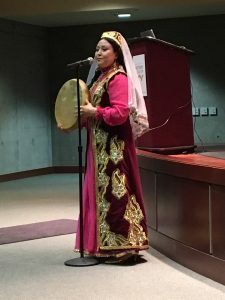 Former STSCA President Roscius Doan spoke at the Glasnost and Goodwill Symposium on January 20 at the Washington State History Museum in Tacoma on his role in the early exchanges with Tashkent. He lived in Tashkent for a year with his family; as a doctor, he treated patients while his wife taught English, and his daughter studied in school. Betsy Bell of Target Seattle also presented on her work with the early exchanges. In particular, she described her work with the STSCA to bring signed letters of peace from Americans to ordinary citizens in Tashkent. Also in attendance were former STSCA President Dan Peterson and former STSCA Board member Dilbar Akhmedova, who performed traditional Uzbek music and dance for the audience. The symposium, which was put on by the Ellison Center for Russian, Eastern European, and Central Asian Studies at the University of Washington, marked the end of a successful exhibit of the same name that showcased the work of the early citizen diplomats who created peaceful bridges of understanding between people in Seattle and the Soviet Union. The exhibit and symposium remind us that citizen diplomacy, our efforts as volunteers and individual citizens, have a huge impact and create lasting change! Tickets Now on Sale for Navruz 2018! → ← Join Us for Our Annual Meeting!